A motorcyclist, driving on a single carriageway with a 40mph speed limit, overtook an articulated lorry. The Northbound and Southbound carriageways were separated by a hatched area bordered by broken white lines. The motorcyclist overtook the lorry by crossing into the hatched area. A van driver emerged from a junction intending to turn right. The motorcyclist came upon the van and braked but couldn’t avoid a collision. The motorcyclist maintained he was doing 50mph and the van driver maintained the lorry had been 60m away when he emerged thinking he had enough room. 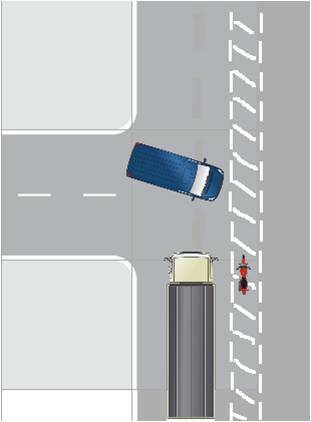 It was decided the van driver should have waited until he had enough room as the size of the lorry blocked his view so he would be unable to see overtaking vehicles. The motorcyclist, on the other hand, was aware of the junction because of the hatched area and it was not safe to overtake. Further it was probable the motorcyclist had been travelling at 60-70mph. Van Driver 20% to blame Motorcyclist 80%to blame.